One of the stated intentions of the National Automotive Policy announced in 2014 was to make Malaysia the regional assembly hub of so-called energy efficient vehicles (EEV). Tax incentives were dangled as a major carrot to attract car makers to not only build their vehicles in our country, but also build the best they have to offer. To date, the strategy has yet to turn the country into the regional export hub that was envisioned, but it has nevertheless attracted a slew of highly-advanced hybrid and plug-in hybrid models from the likes of Mercedes-Benz, BMW, and Volvo all of which are put together in our own backyard. 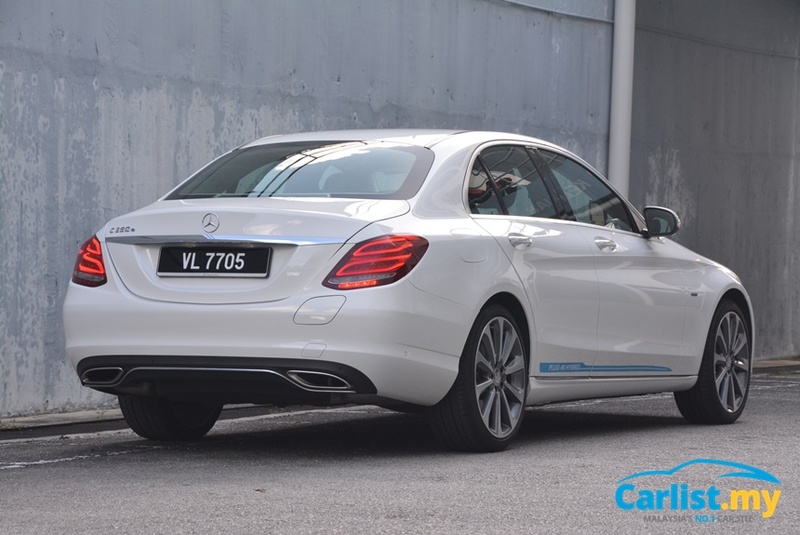 Mercedes-Benz achieved much success with its S400 Hybrid flagship and the previous-generation E300 BlueTec Hybrid, both of which went on to be best-selling models in their respective segments, contributing to the brand’s rise in becoming the leading premium brand in Malaysia. Emboldened by that success, Mercedes is ready to move the game on to plug-in hybrids. 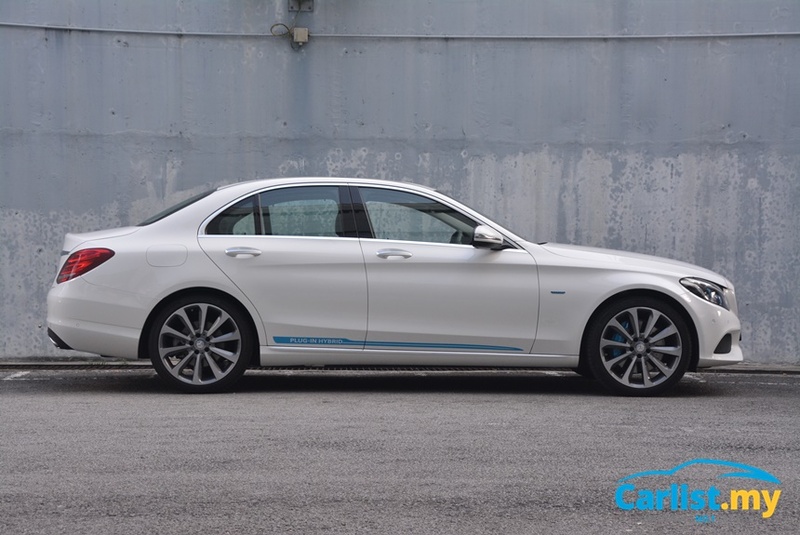 The W213 E-Class E350e has already been confirmed for introduction later this year, and we are also expecting the S-Class facelift to eventually be launched with a plug-in hybrid variant as well. Paving the way to that electrified future is the W205 C-Class C350e that is the subject of today’s review. 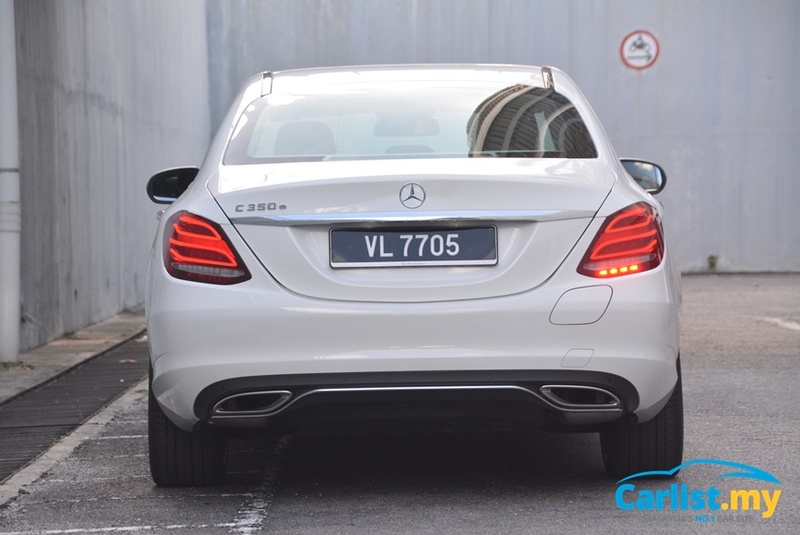 The C350e replaces the C300 as flagship variant of the locally-assembled C-Class range in Malaysia. The considerable savings accrued from tax incentives are returned to the consumer via a lengthened equipment list over the regular C-Class petrol variants. Compared to the C300 it replaces, the C350e additionally gets Airmatic suspension but surrenders the panoramic sunroof for a regular one. The two cars are otherwise evenly-matched on equipment, but the aforementioned tax incentives have helped keep the C350e on the near side of RM300k whereas the C300 had asked for RM307,888. There are three trim combinations offered with the C350e, though they are not all offered concurrently. Early adopters get the car in Avantgarde trim inside out as seen in our test car priced at RM289,888. Gradually, Mercedes will be upgrading the C350e to feature Avantgarde trim on the outside and AMG Line trim on the inside before eventually going full AMG Line inside out. Depending on combination, prices rise to RM294,888 for the Avantgarde/AMG hybrid trim and eventually RM299,888 for the full AMG Line treatment. Powering the C350e is Merc’s 2.0-litre M274 petrol engine tuned to outputs of 211hp and 350Nm – identical setup to the C250. Sandwiched between the turbocharged engine and Merc’s in-house 7G-Tronic automatic transmission is an electric motor rated with outputs of 80hp and 340Nm. The combined effort of this setup yield 279hp and 600Nm, all of which are channelled to the rear wheels. Electricity for the motor is provided by a 6.2 kWh lithium-ion battery claimed to provide an all-electric cruising range of 31km. 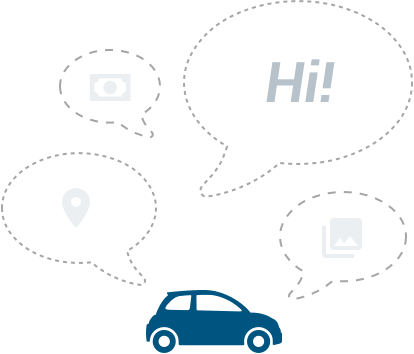 Charging time from empty to full is 1 hour 45 minutes from a dedicated wallbox; the car can also be charged from a regular socket and the user can select between charging at 8A, 10A, and 13A. We charged the car at 8A from our home socket to be safe, but nevertheless found the battery fully replenished in less than three hours. The battery’s bulk inevitably calls for compromises, however. Boot space is slashed from 480 litres in the regular C-Class to just 335 litres, though fold-down back seats can still be called upon to create an expanded 1,370-litre cargo hold. Fuel tank capacity is compromised too, down from 66 in the regular models to 50 litres. There is little say about the C350e’s interior and exterior aesthetics that have not been covered in past reviews of the C-Class. 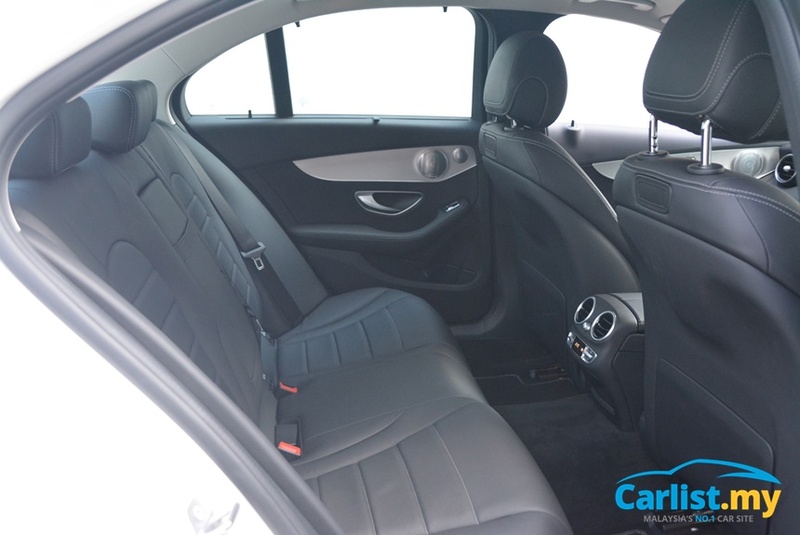 Some blue highlights aside, the car looks identical on the outside and the interior continues to impress with the same expensive-feeling ambiance as the all variants of the C-Class this website has reviewed to date. 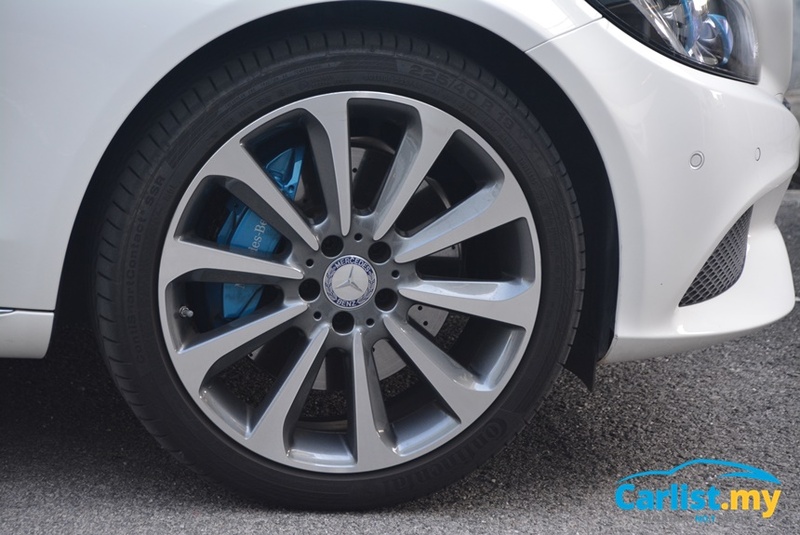 Worth a few words to discuss, however is Mercedes’ unconventional placement of its charging port at the tail end of the vehicle, as opposed to the left front fender preferred by both BMW and Volvo. We suppose there are different situations that suit different cars, but where this writer is concerned, Merc’s tail-end placement allows the port to be as close as possible to the power socket when the car is reverse parked. 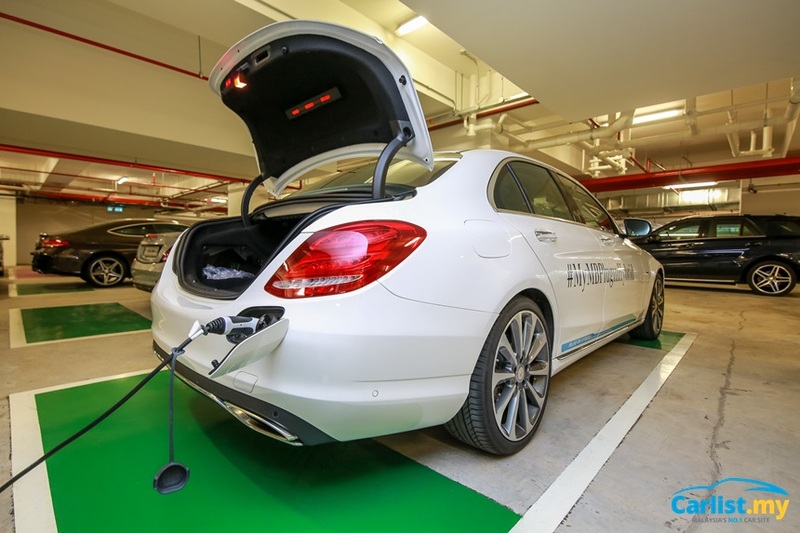 There have been question marks on the charging ports susceptibility to accident damage, but Mercedes-Benz personnel have told us that the port is designed to be reattached easily in the event of an impact. The wiring is also configured in a such a manner that the danger of fire or electric shortage after an accident is actually quite minimal. 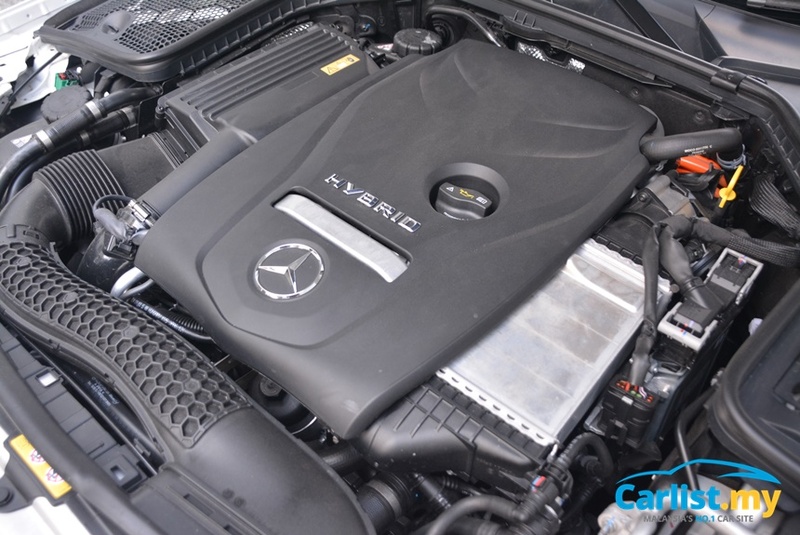 Whilst its claimed combined system output of 279hp and 600Nm may suggest superior performance to the 245hp C300, it is worth remembering that you will be left with the power and torque of a C250 after emptying the hybrid battery’s charge levels. Think of it as a C250-plus with access to an occasional boost of power and your expectations will be spot on. 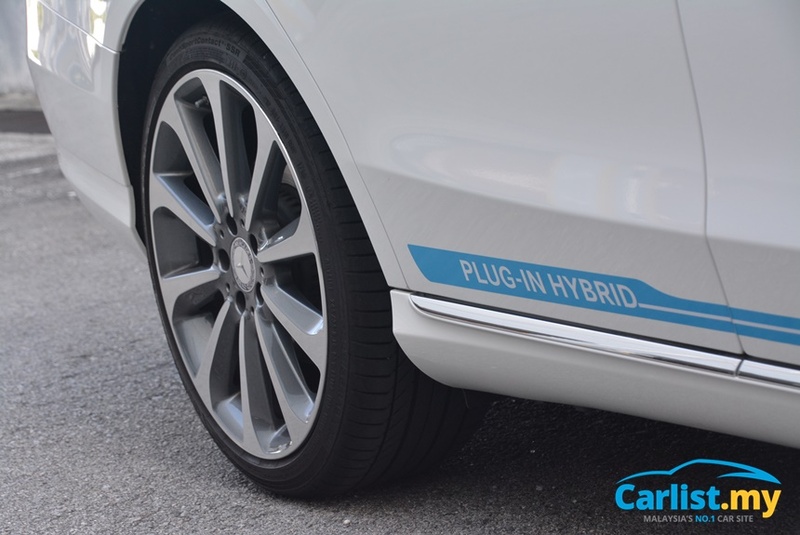 In hybrid mode, the electric motor’s notably comes in handy with its instantaneous torque to deliver immediate acceleration whilst the petrol engine builds up to its crescendo. 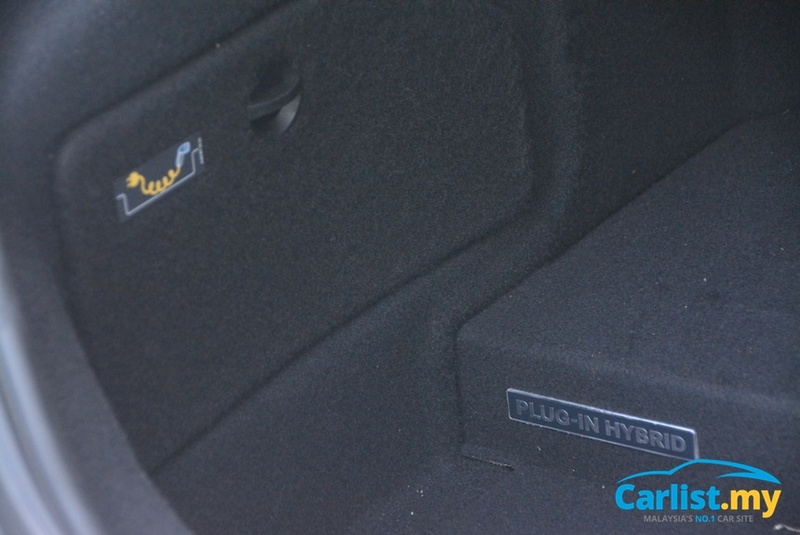 The switchover between the vehicle’s two sources of power is as seamless as can be expected. Fully electric cruising is possible over limited distances with a top speed of 130 km/h. It’s fast and responsive enough to keep up with urban traffic, meaning you can realistically complete short distance trips without needing a single drop of fuel. Handling feels much more fluid than other variants of the C-Class we have sampled to date, but this, we suspect, owes much to the test car’s air suspension – a standard piece of kit for the C350e worldwide. Compared to the regular petrol versions, the air-sprung C350e reins in unwanted bodily movements more effectively whilst riding more smoothly over patched road surfaces. In contrast to conventional combustion engines, PHEVs are disadvantaged when it comes to highway driving. 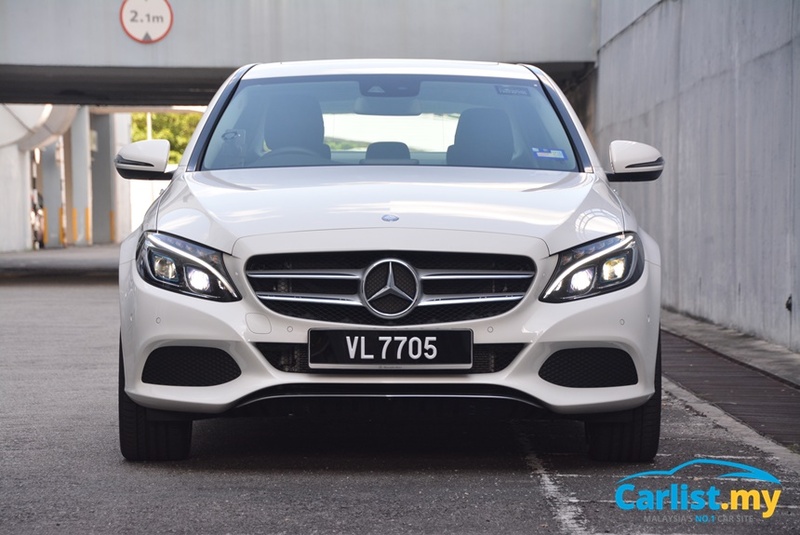 On a trip from the Klang Valley to, say, Penang or JB, a fully-charged C350e is only able to cover no more than 10 to 20 percent of the journey petrol-free. Mercedes-Benz claims an all-electric cruising range of 31km, but we never saw more than 20-25km of range on our trip computer. If your daily commute patterns involve plenty of short trips within a 10km radius of your home, the C350e will save you a lot at the pumps indeed. Over a 460km test route that covered a mix of town driving and a return trip to Cameron Highlands that was cut short by an unfortunate puncture, our C350e’s trip computer returned a measured average of 8.2 litres/100km. For comparison, we managed 8.5 litres/100km in the 1.6-litre petrol C180. 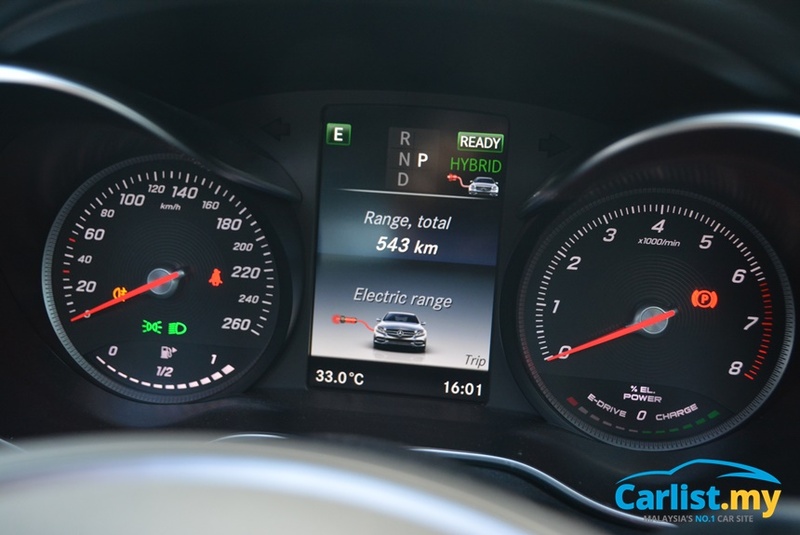 A recent fuel economy challenge amongst media, however, was able to yield numbers in the region of 4.1 to 4.6 litres/100km, admittedly in competitive conditions. In the interest of a comprehensive report, we’d be amiss not to highlight that the C350e’s closest rival, the BMW 330e, managed 6.5 litres/100km when tested by our resident eco-warrior Hans. The C350e is another strong offering from Mercedes-Benz in its highly-successful W205 C-Class range. It is, in unexpected ways, the best-to-drive variant of the family this side of the AMG C63. The standard fitment of AirMatic air suspension certainly helped improve the vehicle dynamics by considerable margins, making it both sweeter to steer and more comfortable to ride.  The overall viability of its appeal, however, depends highly upon your usage pattern. Regular long-distance travellers are unlikely to reap significant benefits in economy from the plug-in hybrid system and will perhaps be best served by the mid-range C250 model which, by the way, is offered exclusively in AMG Line trim these days. For those who spend much time in urban roads, however, the C350e has much to go for it, as it offers the option of delegating propulsion duties to the electric motor for short trips as well as crawls through traffic jams, thus minimizing unnecessary wastage of fuel. The more time you spend in slow congested traffic, the more sense this car makes for you.